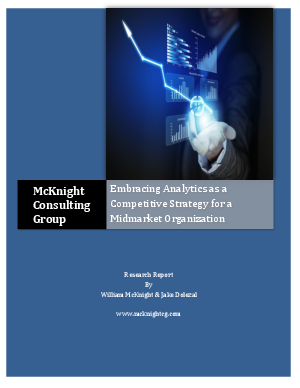 The use of analytics will define the successful midmarket business of the next decade, just as it will define the successful larger organization in this information age. The past decade has seen rapid change in the business climates with an explosion of global competition and economic uncertainty. Despite this, many midmarket companies have thrived by using their size and agility as a competitive advantage. Certainly they have fewer resources than large corporations who are able to invest large sums in IT. However, small yachts can turn and adjust their course much quicker than large cruise ships. The same came be said for midmarket companies. The most successful organizations are ones that can react the quickest to changes in the market place. Midmarket companies can take advantage of their smaller size by being more agile and quicker to change, or even reinvent themselves, to respond to the market. Most organizations, regardless of size, struggle with how to best utilize and manage their important asset of data. However, a midmarket company can turn their data challenges into assets by matching the right technology and sidestep many of the information technology growing pains other companies have faced in years past. This white paper will discuss these challenges and suggest some strategies and solutions to turn midmarket data into a working asset.